The facts of the new polling: Gallup polled 1,067 Republicans and Republican-leaning Independents from their landline and mobile national poll of adults. MoE 4. Bloomberg and the Washington Post polled 391 Republicans and Republican-leaning Independents on mobile and landlines, MoE 6. Gallup shows a close race. 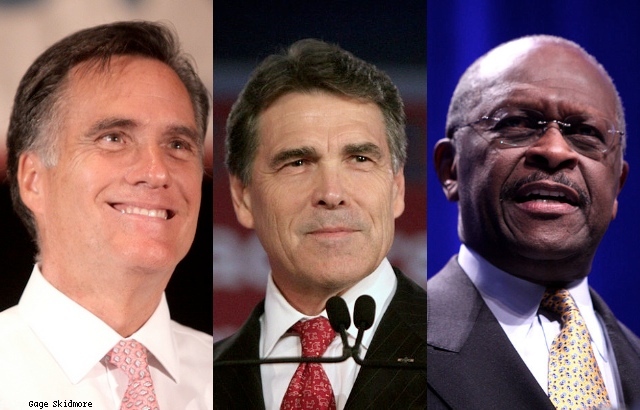 Romney 20, Cain 18, Perry 15, and nobody else is in double digits. By this poll I show only a 59% chance that Romney beats Cain right now, a 73% chance Romney beats Perry right now, and a 64% chance Cain beats Perry. Bloomberg and the Post are less kind to Rick Perry. Romney still leads at 24, Cain is steady at 16, but Perry falls off to 13 there. As with Gallup, Ron Paul is fourth in single digits, and all other candidates are below the Pauldoza line. Between these two polls, I think it’s clear that the race has again stagnated since the Cain surge. Cain had four out of five polls at 17. He’s now had two more at 18 and 16. Romney stays on top in the low 20s. Perry remains within striking distance in the mid teens. The debates matter. A majority of Republican primary voters are watching them. Tonight may bring another big shift, but this is where the Republican party appears to be going into this debate.